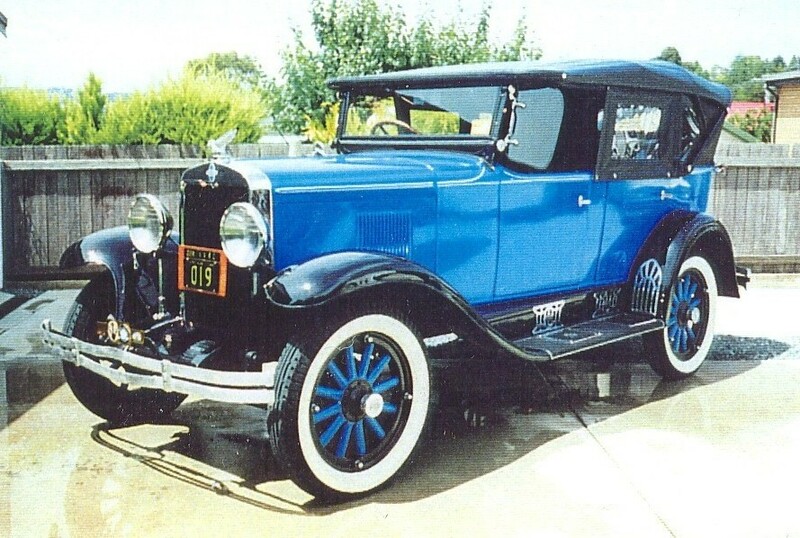 THE STORY OF OUR 1929 CHEVROLET TOURER – July 2005 – – Southern Tablelands Heritage Automotive Restorers Club Inc.
Like most of us I started a love affair of old cars at an early age and after many years of “gunna” I took the big leap into the unknown. I heard that Kingsley Southwell of “Brooklands”, Hall, had a car. So in 1974 I acquired the remnants of what looked like may have at one time been a car and this pile of rust and mud arrived home on a box trailer and ute much to the disbelief of my friends and neighbours. I soon became the laughing stock of the neighbourhood which in turn made me more determined to make this restoration come together. I had to source another vehicle to get all the hard to find spare parts, so off I went to Cudal with car trailer in tow for another trailer load. After a short time (in restoration terms) the car emerged from it’s hiding place on its way to get rego. and the hecklers soon became enthused passengers!. In 1992 the Chev won three trophies at the QWRC concourse day. Vintage car 1920 to 1930. In 1993 my wife Dianne, our daughter Samantha and myself entered the FIVA World rally, then set of to Tasmania. We traveled down in the company of Bill and Helen Phillips who were members of the CACMC. Sadly Bill passed away a few years ago. From then on we have been on many rallies and club runs. So from rusty beginnings to this day I still get a buzz every time I am behind the wheel of my old Chevy. 1929 Chevrolet international ac tourer. 194 cubic inch six alloy with force fed oil to rocker gear splash fed crankshaft. Carter up draft carb fuel pump on camshaft. Fuel gauge on tank with six volt delco remy elect.